The 14th of February is a day devoted to celebrating love. You can express your affection to that special person in the usual way (go out to dinner, box of candy, over priced flowers) or with a little imagination and for a lot less cash, celebrate at home. Create a romantic dinner for two. It doesn’t matter if you are planning dinner or a leisurely breakfast, make it cozy and intimate. Food in front of a roaring fire is always romantic especially if you are seated at a low table with floor pillows. 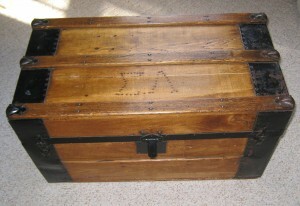 You can use a coffee table or in this instance an old wood trunk. 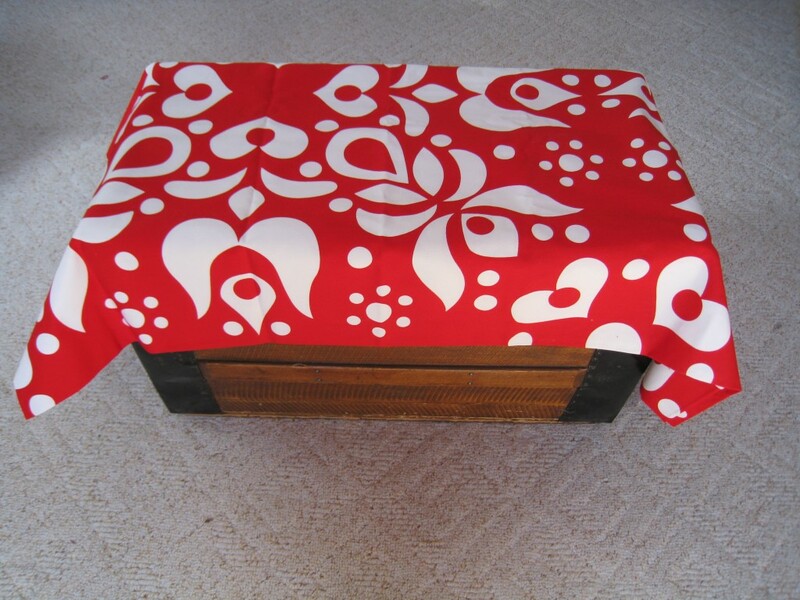 Cover it with a table cloth or a piece of red fabric. I fell in love with this bold red and white print at IKEA. It's perfect for a Valentine's Day tablecloth. There isn’t a single heart or flower in this setting. 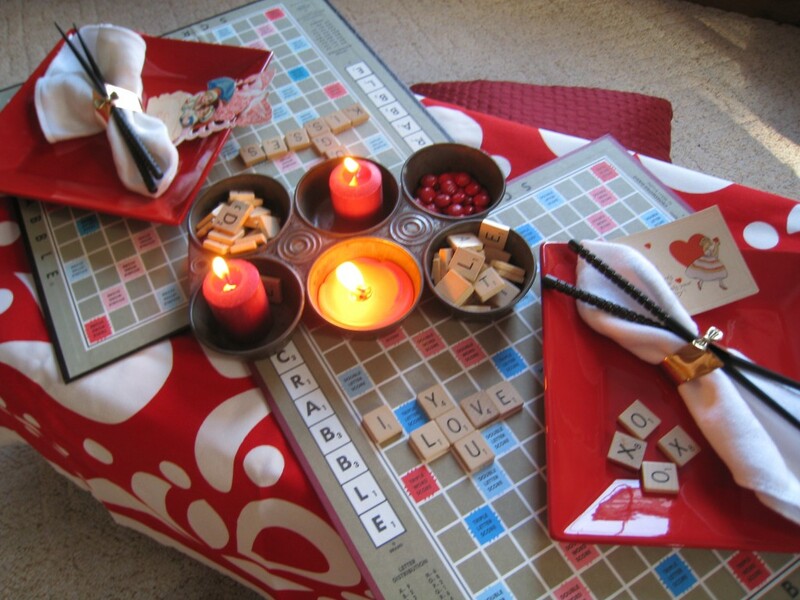 Instead of placemats, I pulled out old Scrabble board games Write a message or spell out your feelings for each other with the tiles. You can use almost anything as a placemat or charger. Have fun with Scrabble boards. An old muffin tin is the perfect size for extra letters, votive candles and candy (no expensive and fattening box of chocolates here!). 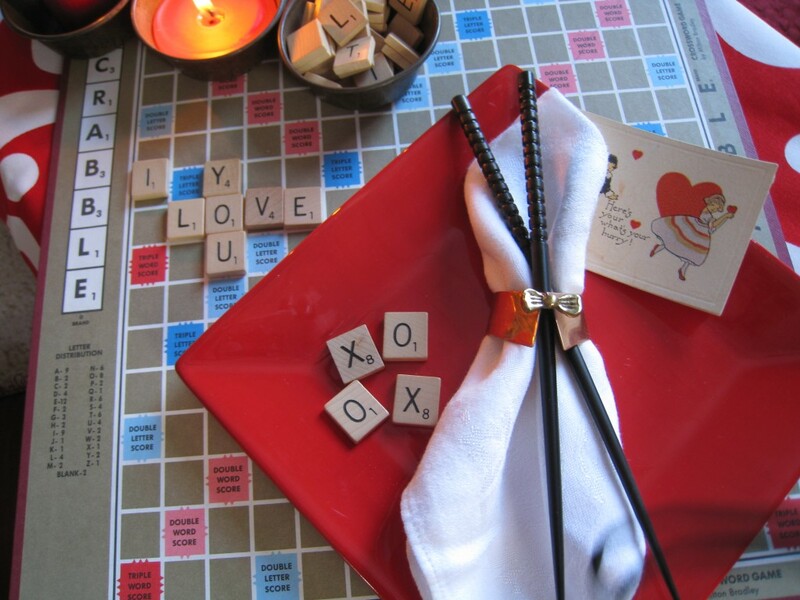 You know you will want extra Scrabble pieces with this dinner. 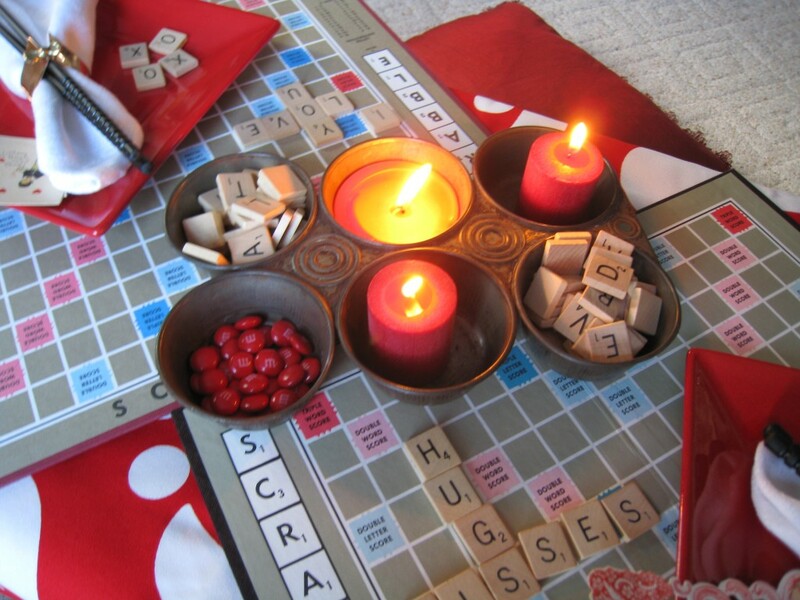 Use a vintage muffin tin for candles and letters. The valentine card is vintage, but the XOXO says it all. Use dinnerware you have left over from Christmas. 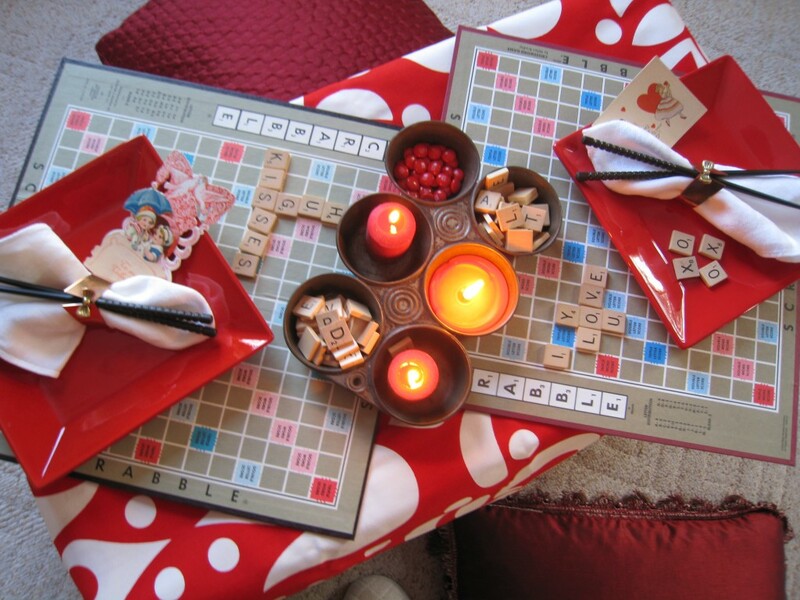 Square red plates set “on point” complement the square game boards. You could buy a new valentine, but I love the sappy sentiments on old, vintage cards! Little copper napkin rings surround softly folded white napkins. Dinner should be simple. After all, the emphasis should be on dining, not cooking. Chinese take-out allows you both to share. Tuck a pair of chop sticks in the napkin ring. Add a couple of floor pillows and you have a romantic evening ready to surprise someone you love. Tell your love how you feel. I say spell it out! Merri, YOu are so creative and very tallented! I just am crazy about this little tablescape. Filled with great design and so much fun for my eyes! 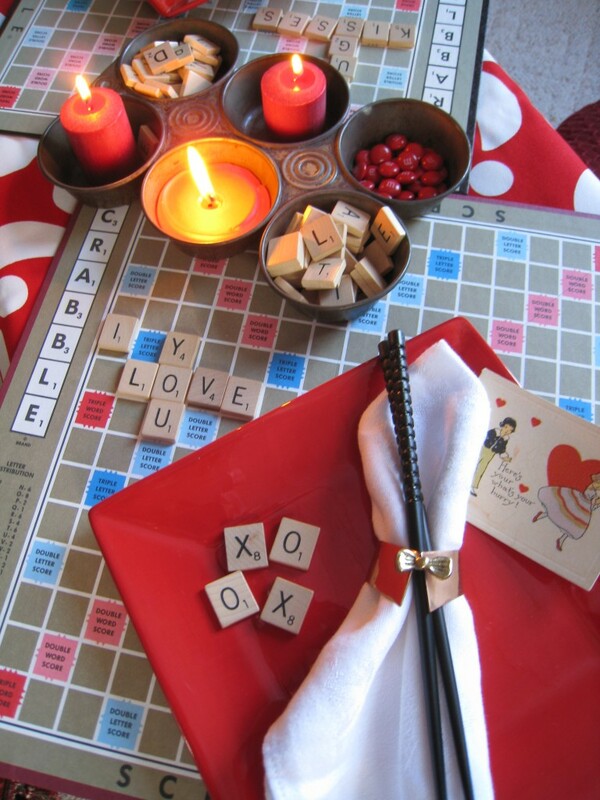 My husband and I would love to sit down at this table and play scrabble (I’d win!) and eat chinese food. I love this! P.S. Merri, I am a new follower! You are very inspirational! Hi Merri. 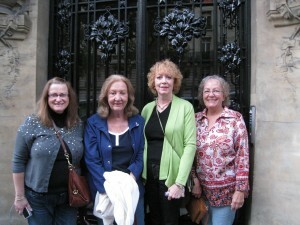 Thanks for stopping in and commenting at my blog, how sweet of you. 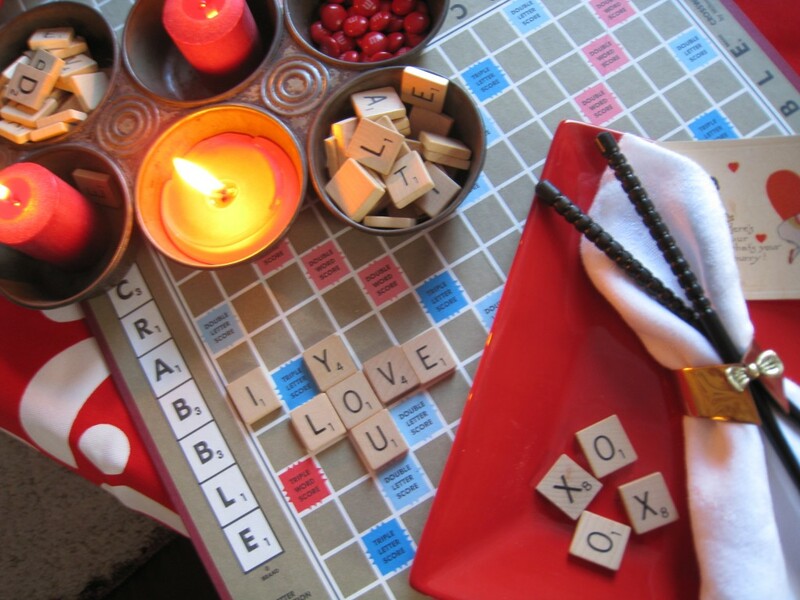 I love your scrabble table idea. What a fun tablescape. I have been looking for old scrabble games at yard sales and good will but no luck so far. I would love to use this theme sometime. Thanks for the inspiration. Merri, you win first prize for creativity! I absolutely love this idea and have bookmarked this post for future reference. Everything about this setting is a delight. Thank you for sharing this idea with all of us. Happy Valentine’s Day! I’m adding myself as a follower. I don’t want to miss the other creative ideas you share. This is such a clever idea. Now I will have my eyes open for vintage game boards when I am yard saling..this is a whole new way to use them. 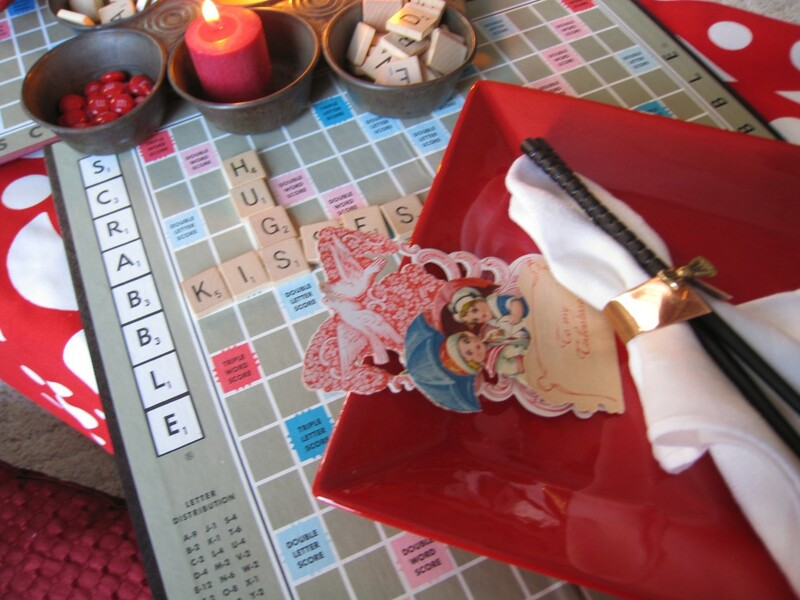 What a sweet and fun tablescape — this looks like lots of Valentine’s fun! Thanks, I love to set a fun table and this one was so easy to do! Thanks! Goodwill is also a place to look for vintage games. Doesn’t matter if some of the parts are missing! Thanks so much. Who said Valentine’s Day has to be about hearts and flowers only? Thanks! Keep looking. You never know what you will find at Goodwill that will work. Thanks, I would beat my husband at Scrabble too! Every now and then I come across gems like this, thank you!